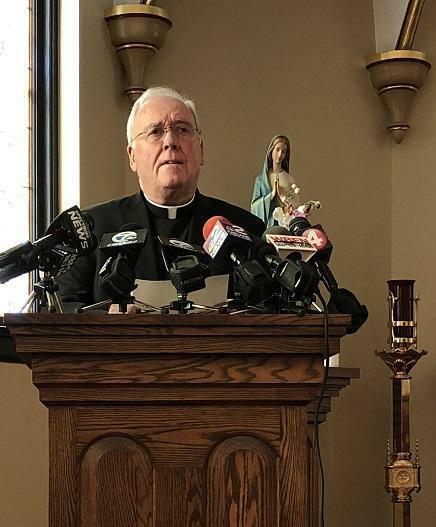 BUFFALO, NY (WBFO) – Bishop Richard Malone is responding to the news conference held by whistleblower Siobhan O’Connor, who released diocesan documents to authorities and the media about the handling of sexual abuse victims. “In fact, her prior, written communications to the Bishop demonstrate her complete admiration for the Bishop and his efforts to lead the Diocese. Her comments now are plainly and embarrassingly contradictory. Here are her actual email communications with the Bishop and others at the Chancery that she now criticizes. “I will always be deeply grateful to have worked with you Bishop…In truly countless ways you have inspired and edified me. I am the better for having known and worked with you…May Our Lord richly bless you for all that you do for Him and for His Church! “You’re most welcome, Bishop – it does my Chancery heart good to be able to help you in these ways. I trust that the…job will be a good thing for me long term, but this short-term transition is quite painful! I truly missed you and the Chancery today! “How I will miss you all! Through tumultuous times and many memorable moments, it has been my pleasure to work with you in various capacities. “I must thank Bishop Malone without whom none of my Catholic Center experiences would have been possible! Bishop – it has been a privilege to work by your side as you shepherd our diocese.